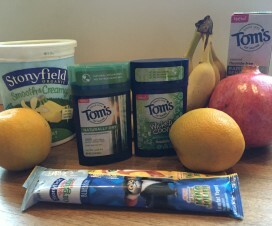 From time to time, the folks at Stonyfield send me products to review. 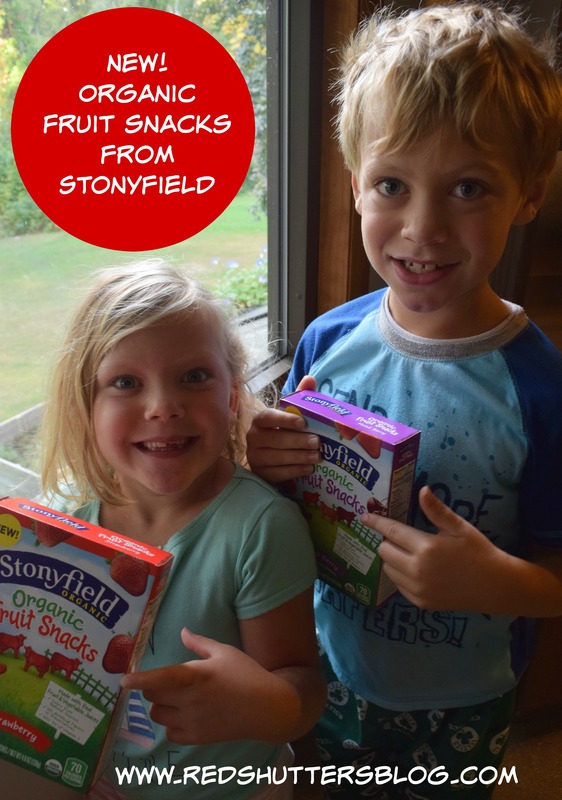 My family loves this part of my blogging life, and is all too happy to be my “guinea pigs.” Recently, Stonyfield sent me their brand-new Organic Fruit Snacks to try out, and I knew as I walked in my front door, we had a home run on our hands. My second indication that they liked the fruit snacks was that I had to hide what was left lest I not have any to photograph for this post! 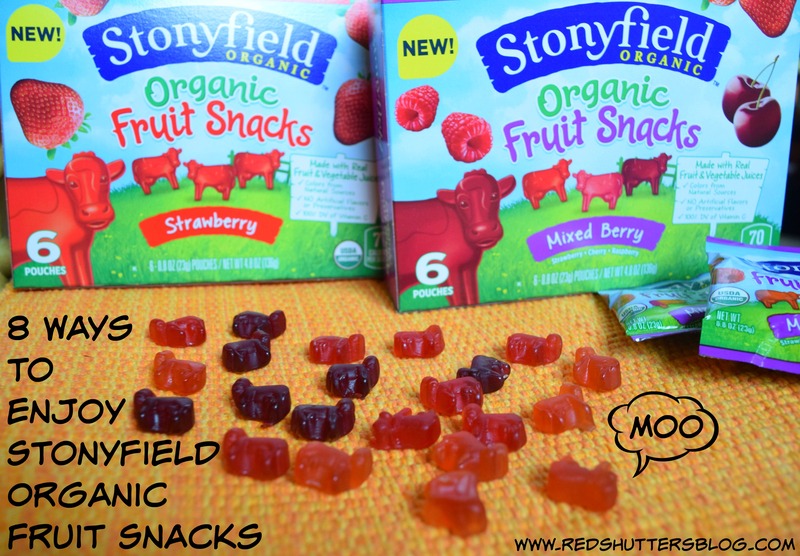 Stonyfield’s Organic Fruit Snacks come in Strawberry and Mixed Berry flavors and are made with real fruit juice. A box contains six pouches, and has the benefit of not needing refrigeration—a departure for Stonyfield, as the company’s other products are found in the dairy aisle. My family’s enthusiasm for these new additions to our snack cabinet got me thinking about how best to incorporate the fruit snacks into our diet. They’re a great snack option, of course—perfect for on-the-go jaunts about town and longer road trips. But how else can we eat them? Here are 8 ways! Halloween – I’ve never been a fan of all the candy my kids bring home from Halloween trick or treating. The sugar, the chemicals, the cavities! What if they brought home organic fruit snacks instead? At only 70 calories a packet, it’s a better choice that chocolate bars and gummy bears. Game Time – I know what you’re thinking: kids shouldn’t play with their food. But have you seen these fruit snacks? They’re shaped like cows! They’re moo-tastic, as my kids would say. They’d make the perfect distraction while dinner is cooking; I’d give them to the kids with instructions to create a story about the cows. Or, I’d ask my Lego-obsessed son to build a cart for the cows to travel around the dining room table. Or, I’d invite my daughter to draw a picture of where the cows live. School Lunches – The truth is school lunches can be a challenge to pack—at least in my house. 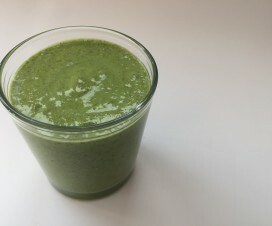 One way I can get my kids to eat what I send in their lunch boxes is do the old “bait and switch.” In other words, I change up the contents of their lunches, and sometimes, include items they love. They’ll be the hit of the lunch table with these fruit snacks. Birthday Goodie Bags – What do you pack in kids’ birthday party goodie bags? Stuff the kids never play with again? I’ve given up on that, instead making goodie bags of books, crayons, pencils, and, now, fruit snacks. Easter Eggs – I’m a big fan of Easter, throwing an annual Easter Egg Hunt in our backyard. I hunt for items to stuff in the eggs that are free from chemicals and these fruit snacks are on my must-buy list come March. 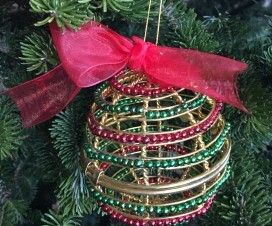 Stocking Stuffers – I know, Christmas already? But we’re only weeks ago, so it’s not too soon to start planning your shopping list. In my house, stocking stuffers are practical items, such as socks, underwear, and toothpaste. This year, I’m going to slide in fruit snacks among the sundries; I know the kids will enjoy them a lot more than new dental floss. Dessert Toppings – My kids love adding toppings to their frozen yogurt and ice cream. I cringe because the toppings they love are filled with preservatives, dyes, and other chemicals. These fruits snacks would be a great alternative to sprinkles and be a fun addition to ice cream as well as cakes and cupcakes. Spouse’s Work Bag – My spouse, you say? Oh, yes. This idea came straight from my husband: I found him in the kitchen one evening around 10 PM with his hand literally in the box of Stonyfield Fruit Snacks. “Hey!” I said. “Those are for the kids.” He looked at me, sheepishly. “Oh, well, they’re really good.” He popped a bag of little cows in his mouth and snuck out of the kitchen. I’m sure he’d like a bag or two for a pick-me-up tomorrow afternoon at work. Stonyfield’s Organic Fruit Snacks are sold in grocery stores where other Stonyfield products can be found. Hope you enjoy them as much as my family did! 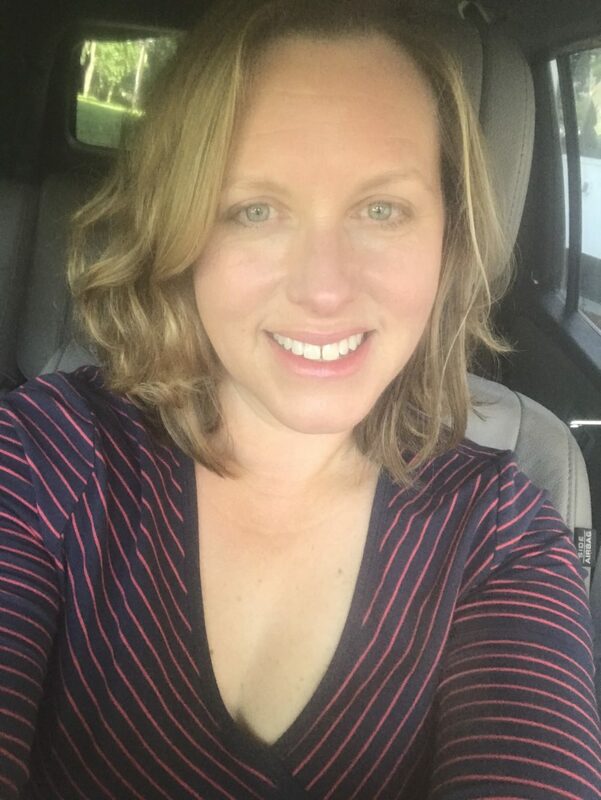 Disclosure: As a Stonyfield Blogger, I created this post in partnership with Stonyfield. All opinions here are mine. So many clever ideas! 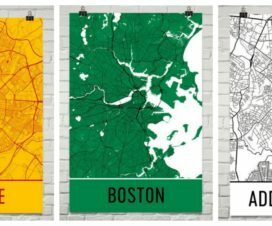 Have you found them locally? I’m hoping they make their way into our Whole Foods very soon. Yes, I’m keeping my eyes out for them!